We traveled down to Warrenton and Round Top on a Sunday this year. The crowds were certainly lighter than on a Saturday, so this might be my new day to venture over there from now on. 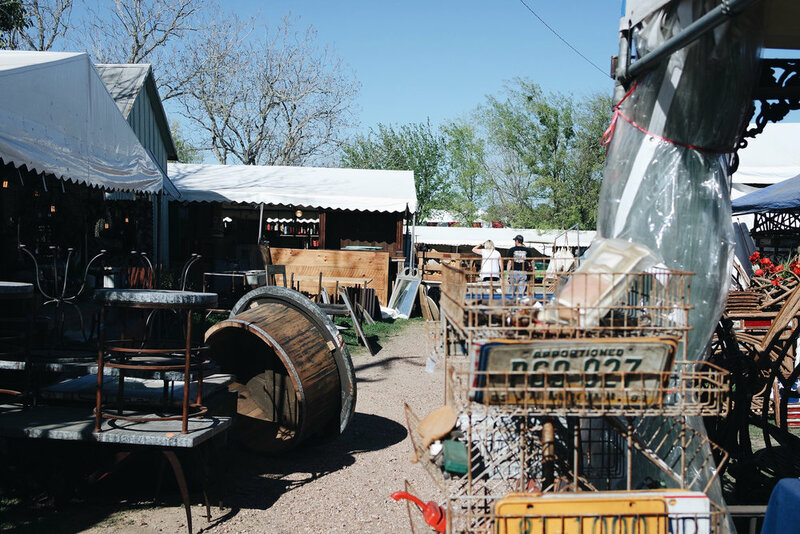 For those unaware, Texas Antiques Week takes place in these tiny towns in the middle of nowhere twice a year. If you've never been, you really should as it is an experience to be had and there's a good chance you'll get addicted to going and start counting the days till the next one! Arriving around 2 pm, we made our way down to the Junk Gypsy's brick and mortar store to listen to some music and browse their great selection of items. We then wandered down to Warrenton where we spent the remainder of the day jumping from tent to tent where most of our conversations revolved around, "Oh you're going to look in this tent? Okay cool, I'll be over in this one." Then sometime around 6 pm when all the people were starting to close up shop for the day, we hopped back into our car and wandered on down the road back to Austin. Antiques Week is such a fun event and it just continues to get better and better with age. You never know what you'll find out in those fields! In case you missed it, here's my post from the 2014 fall show HERE.